We are on the brink of a powerful new world. The exponential growth of the Internet of Things will bring a new way of life and new possibilities in the future, and this brings to us a multitude of opportunities. 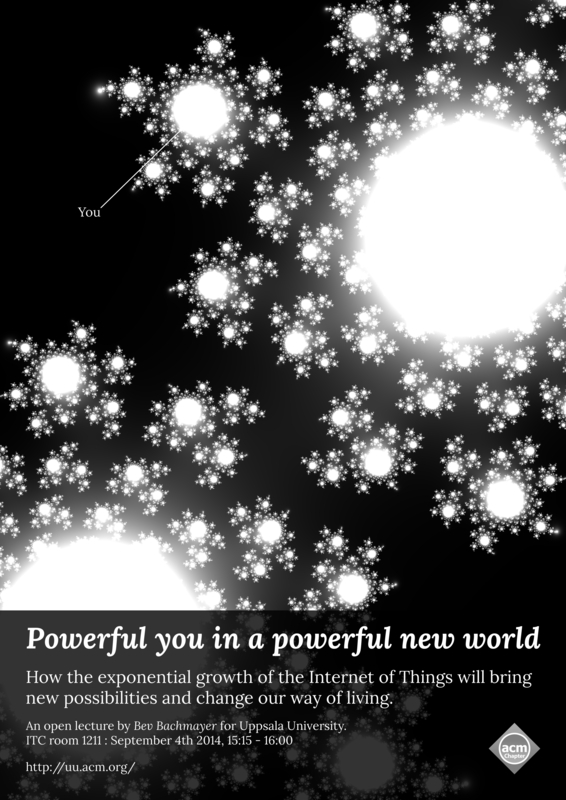 What is Internet of Things? What does it encompass and how can you become part of this next big thing in computing? Come and find out! Bev Bachmayer has worked in diverse software engineering, performance engineering and engineering management positions in the US and Europe during her 31 years at Intel. She is currently working on a project defining solution stacks for Internet of Things. Additionally, she works with software vendors in Europe, her key area of interest has been performance analysis and optimization of software on new computer architectures. Bev mentors female students in technology (both students and junior engineers) via MentorNet and within Intel. Additionally, she volunteers her time as Vice Chair of ACM-W Europe executive committee. She is a member of ACM, ACM-W Europe, IEEE, IEEE Computer Society and the European Professional Women’s Association (EPWN). . Bev holds a Bachelor’s degree in Computer Science from the University of Oregon and an MBA from Portland State University. Things that would be fun doing! There is a new list of ideas that we could do. If you would like to volunteer for any of those, or even for your own brilliant idea, please! Do not hesitate to contact us! 🙂 We also welcome your ideas, so feel free to comment! Our next meeting will be held in Polacksbacken, meeting room 1345, Thursday May 8 at 9.00 AM. Everyone is welcome! If you would like some buns and coffee write your name in the doodle https://doodle.com/r4erbnkyuaauf87p by Monday, May 5 (include any dietary requirements, please!). Otherwise, you can just show up! !